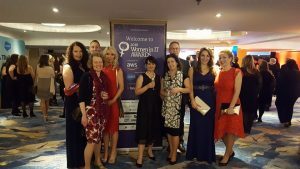 On Wednesday 31 January, several Atos colleagues, including UK and Ireland CEO of Worldline, Lisa Coleman, and SVP B&PS, UK and Ireland Toby Goldblatt, attended the 2018 Women in IT Awards, hosted by Information Age. Atos showcased two finalist nominees – Lisa Coleman for Business Leader of the Year and Nicoleta Raportaru, Executive Consultant in Digital Transformation, for Young Leader of the Year. The evening featured some exceptional contributions from both current and future leaders in the industry, and celebrated the huge shift in the demographic of the technology industry, from once being predominately male to now triumphing some fantastic female leaders. The event also featured high-profile speakers, such as Martha Lane-Fox, founder of lastminute.com, and Caroline Glackin, site leader at Amazon Web Services, as well as featuring some brilliant contributions from both current and future leaders in the industry.